We're having a baby boy in April! We're so freaking excited! 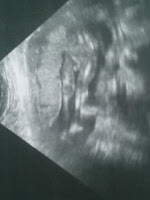 I (brad) and more excited that I was right than I was about the outcome of the ultrasound. As a husband I only get to be right once in a while. HAHA. We are working on picking a name but are open to some suggestions. Let's hear your name choices for little baby boy huntsman. Just decided to post my Mama's Boy song. I love my mom and I wrote this song about her and to all of the wonderful mothers in the world. I'm so excited to announce that we are having a baby in April. We have waited so long for this and neither Rachael nor I can wait for it. We'll keep it updated when we know more. Last week, we found out that we were not going to close on our house before the end of the month. We quickly found a storage unit and started moving stuff in there. We had to file an extension because our lender is an idiot and didn't get his stuff together very quickly. Last Wednesday, we moved all of our "big stuff" out and little by little the rest of our stuff. I forgot how much "stuff" we have until we moved...and boy do we have a lot. My (Rachael) sister Lisa, came up for Friday and Saturday and helped me clean. Also, we had some very nice ladies from our ward come on Saturday morning and help us finish cleaning. So thanks to everyone's help we were able to be done on Saturday night. It looked so clean, cleaner than it was when we moved in. I have created a Pampered Chef blog so I don't have to use this one for business. Check it out today....rachpampchef.blogspot.com. I have January's guest special posted so let me know if you want me to order something for you! Wow! Where has all the time gone. The holidays have come and gone and we haven't blogged about anything. We spend Thanksgiving at my parent house in Soda Springs with 75 other family members. It was so much fun to get together and eat good food. We had a blast. For Christmas, we were able to go Rock Springs to spend time the Brad's family. All three of his sisters and their families were there. His sister, Michelle, had a baby on Nov 3o so we were able to meet him, have him blessed and spend time with the family. For New Years, my sister Lisa and her friend came up and we played Wii games & had some really good food. They bought up Guitar Hero and we rocked all night long. I've found a new favorite game for the Wii. Brad has his gallbladder out on Jan 4 and is recovering very nicely from that. His parents came up this weekend and were able to spend some time with us.